THE string of vessels making their way to Brisbane and Newcastle, railed supplies from South Australia into New South Wales, and hopes of a big sorghum crop have held feedgrain prices steady in the past week. A tough growing season in parts of Victoria and NSW means some canola crops are being cut for hay instead of harvested for seed. However, the market is largely nominal, as little physical volume is trading in the prompt market now that many feedlots have extended their coverage to November or December. This represents market realisation that the winter crop in much of northern NSW is now beyond redemption, and also that the window for planting sorghum is open in southern Queensland and northern NSW, where big areas of fallow are ready for the summer crop if good rain falls in coming weeks. Narrabri-based AgVantage broker, Josh Brown, said has described the market as fairly steady. “We’re getting to the pointy end of this winter crop, and things aren’t getting better,” Mr Brown said. Growers with stored wheat in northern NSW have been offering at around $500 per tonne ex farm, about $15-$20/t above bids. Where growers have been lucky enough to jag 30-50 millimetres or more of rain, some early sorghum is being planted, but the vast majority of growers are holding out for at least 25-50mm in order to plant a sorghum crop with confidence. Traders report signs of increasing feed demand in coming months, with dry conditions pushing more cattle into the market at rates deemed affordable by feedlotters who believe current grain prices cannot go higher. Darling Downs new-crop sorghum is trading for March-April delivery at $380/t, and old-crop is about $30/t higher in a sellers’ market, while the old-crop Darling Downs wheat market is trading at $450/t, and barley is around $465/t. In cottonseed, ex gin markets are trading at $600-$610/t, well below the peaks of a few weeks ago. Delta Agribusiness broker, Meg Delyall, said activity on the southwest slopes of NSW has also slowed, with rain of around 7-30mm, and 10-15mm on average, so far this month being enough to spark pasture and crop growth. “That little bit of rain has been enough to make demand from end-users and graziers tail off, especially now that daytime temperatures are getting warmer, and the risk of frost is dissipating,” Ms Delyall said. Barley for prompt sale ex farm is currently trading at around $445-$450/t on-farm on the NSW southwest slopes, while SFW1 wheat is trading at around $410-$420 on farm, and lupins are changing hands at $600/t. Ms Delyall said grain coming into central NSW by rail was more attractively priced to end users than that being railed or road-freighted in from South Australia or Victoria. With the southern NSW market preparing for the arrival of grain shipped via Port Kembla, port prices for wheat ex Brisbane, Newcastle and Port Kembla are now close to parity with each other. “Our grain prices at Kembla versus Newcastle are trading flat, when Newcastle is normally $20-30/t dearer than Kembla, and Brisbane is usually dearer again because that feeds into where so much feed demand is. Perhaps adding to this conversion of values is the arrival from Adelaide this week at Port Kembla of the bulk carrier, Densa Lion. It would be the first grain shipment into Port Kembla this year, and is believed to be carrying wheat for use in the Manildra Group’s Shoalhaven Starches plant at Nowra. While Victoria’s Western District is in good shape for crops and pastures, dry and windy weather on top of last month’s run of frosts have its Mallee crop looking for a drink, and yield prospects on a knife-edge in the northern Wimmera. 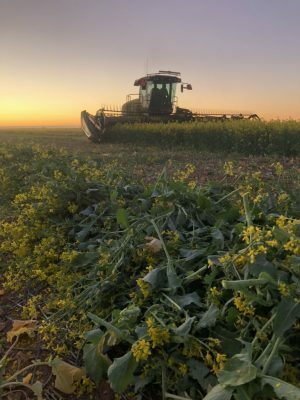 Some canola crops in central and southern NSW, and also Victoria, are now being assessed to see if they have enough biomass to cut for hay, or enough yield potential to harvest for seed. Canola crops are generally in worse shape than cereals due to their late and patchy germination. Victoria’s feed market continues to focus on old-crop lentils, and Australian Grain Export’s Oliver Reid said they have been trading at around $400-$420/t ex farm Mallee and Wimmera.